Kirtley Jarvis' artwork is grounded in the quotidian, a world of hastily written notes and scraps of collected information. The kinds of offhand messages that busy people tend to overlook or acknowledge only fleetingly. These often crudely handwritten admonitions are the vernacular shorthand that the artist uses to create paeans to everyday tragedies. In reproducing what often amount to rudimentary scribbles, Jarvis reveals her empathy for underachievers, social misfits, and in recent work, the homeless. Alternating between hand embroidery and wire armature, in her modest way, the artist preserves these otherwise ephemeral documents and reveals her affection for the very human foibles that these transient manuscripts capture. Based on the adaptive reuse of everyday objects, Jarvis freely recycles both texts and objects as artist materials. Whereas, most assemblage tends toward transforming found items into mytho-poetic objects, Jarvis uses grocery lists, phone messages and personal notations to ground her artmaking in discrete personal narratives. Several of the artworks including Wired and Clock Faces, remain largely autobiographical, referring to Jarvis' family and work experience. The Last Supper, for example, features the menu of her father-in-law's last hospital meal embroidered onto a ubiquitous patient gown. Sadness, failure and loss are a constant theme in the work. However, many of Jarvis' contributions to this exhibition step outside of personal experience to address the misfortune of others. Upon entering the exhibition space one passes through Please Help a set of printed banners, made up of the words HOMELES PLEASE HELP GOD BLESS, repeated over and over as a graphic motif. Creating a veiled entry to her exhibition, the artist transforms this plaintive plea into a mantra. 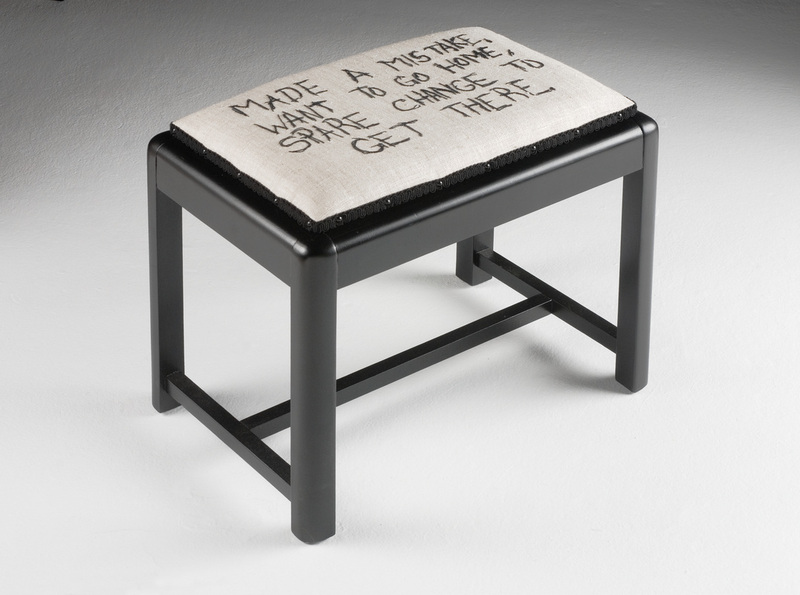 Continuing the theme of homelessness, Jarvis recontextualizes the writing of anonymous street people and panhandlers, transferring their words onto a series of familiar objects, including the respective texts from Traviling and Mistake. 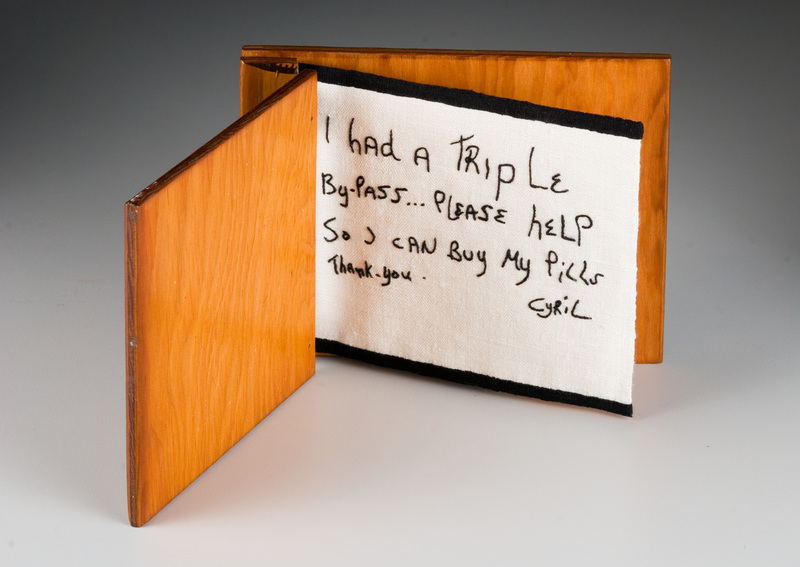 Both texts have been hand embroidered into the cushions that sit atop footstools. Taken out of context, either might be mistaken for an expanded Haiku, but the plain language, crude script and misspelling make it hard not to feel some sympathy for whoever wrote these words. Embroidering the text onto a footstool, an innocuous place to rest one's weary feet, Jarvis adds gravity to the plight of the absent authors. The words trigger our empathy. In Menu, a piece that awkwardly relates to The Last Supper, the artist achieves a similar effect by superimposing Homeless + Hungry Will Work for Food or $ on a red restaurant menu brimming with dining selections. If the message appears heavy handed, it is also a sly attempt to speak on behalf of those who suffer real hunger among us. Autographs features two complementary texts: I had a triple by-pass...Please help so I can buy my pills. Thank-you, Cyril and Won't refuse food, Chris embroidered into a souvenir autograph book. Ironically, each piece is signed by its respective author. All of the original writing was purchased by Jarvis directly from people on the street. The artist took time to explain her work and paid each person $5.00 for their otherwise disposable placards. Some, like Cyril and Chris, were so curious about the project they insisted on signing their work. Each piece gives voice to those who are often all but invisible in our increasingly cloistered communities, reminding us of the politically motivated cutbacks to social services, and the fact that municipalities are increasingly prone to legislating policies that criminalize poverty. Jarvis' work implies the presence of homelessness, abuse and mental illness in our communities by addressing its invisibility, its absence. But this absence is difficult to quantify, and the cruel truth is that despite our best intentions we are unlikely to act on the message. Conversely, what Jarvis' quietly confrontational artworks succeed in doing is making us aware of our own privilege, and just how vulnerable that privilege can be. How often do we stop and consider our social or financial vulnerability? How secure are our jobs? How much debt can we manage? What happens if we develop a serious long term illness or a form of mental illness? Is our future, let along our children's secure? What means are in place to protect us in an increasingly market driven economy where the social safety net has been downsized? Jarvis' art mirrors these concerns and she is keenly aware of her own vulnerability as a working artist and a woman. In her artist statement she notes: "Some bad luck - an accident - illness - a few missed pay cheques - depression - schizophrenia - simply getting old. How close are we to being completely disenfranchised and disconnected?" There is of course no easy answer, and her decision to address this provocative issue strikes a troubling chord.